Mike is helping Daphne in the Coffee Shop. Madge comes in and tells Daphne that she's had a row with Harold. Daphne tells her about Harold getting the diamond back in the ring. Madge is horrified and runs out of the Coffee Shop. Harold is still up to his waist in water looking for the ring. Unfortunately, all he can find is can pulls. Madge runs up and asks him if it was true that it was the real diamond. He says it was and is very angry. When Madge hears it was worth $3000, she gets into the lake to look as well! Jane apologises to Gail for Mrs Mangel gatecrashing their engagement party. She gives them a plant as an engagement present. Gail tells Paul that they can't keep up the pretence - they're being so devious. Paul reminds her that she agreed to marry him to avoid heartbreak - it's just social conditioning that you have to be in love in order to get married. Gail agrees. Madge and Harold are still in the lake looking for the ring. Madge is apologising profusely as Harold rants. 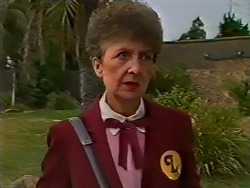 Mrs Mangel sees them exiting the lake and is not impressed. Madge tells her to shut her face! Harold, comes in very wet, much to Jane's surprise. He tells Paul that he has to drain the lake. Paul tries not to laugh. Madgeis cross with Harold for calling her a nincompoop. Henry breaks the good news that Charlene has found her diamond(!) and Madge glares at him. HENRY: Charlene, your daughter, you know, she's about so high, smells of petrol. Paul tells Harold that he can't get the lake drained - it will cost more than the ring's worth. Even if they did pump the water out, they still might not find it in the mud. He suggests that Harold hires the equipment himself. Gail suggests the insurance, but Harold says they haven't got any. He stalks out leaving Paul to survey the muddy footprints he's left. He and Gail burst into giggles. Paul says it's a lot of fuss over an engagement ring - he wonders why people bother to buy them in the first place. Gail quietly looks down at her own ring and smiles. Des wants Mike to help him with the nursery tonight but Mike wants to go out on his bike. He relents eventually, as long as he can invite Jane over. 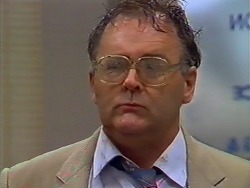 Harold rushes in, still wet and asks if they've got a broomstick. They regard him silently. Eventually Daphne regains enough composure to direct him to the kitchen. MIKE: Must be for Mrs Mangel! Harold has his feet in a bowl of hot water and is inhaling steam from a bowl. Harold says that he's had a very harrowing day. 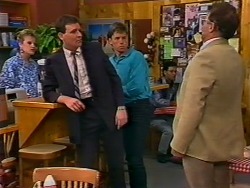 Jane is just off to Mike's, much to Mrs Mangel's surprise - she says that Mike has neglected Jane for his bike lately. Madge comes round to see Mrs Mangel to apologise for telling her to shut her face(!) Harold puts a towel over his face and ignores Madge. 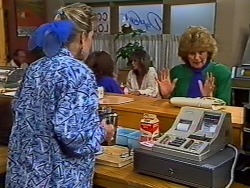 Jane drags Mrs Mangel out so Madge can talk to Harold. 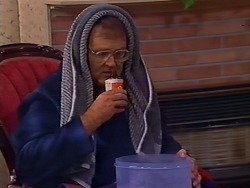 When Jane and Mrs Mangel have gone, Madge tries to talk to Harold who is under the towel, inhaling steam. She starts to cry and says how sorry she is. She says she'd like to be engaged to him again when Henry finds the ring (he's out looking for it). But Harold says that it's too late - their engagement is off. Madge is crying over the broken engagement with Harold. Henry puts his arm around her and says that Harold will come around. Henry answers the door to Paul - he's comes to say he might have a solution to the ring problem. Apparently there is a filtration machine that can be used instead of a drainer, and Paul says he'd been meaning to clean the lake anyway. He just needs someone to do the job and Henry volunteers. Daphne is bored out of her mind listening to Mrs Mangel's tips on child rearing. She notices that some wallpaper has peeled off, so she goes up the ladder to stick it back on. 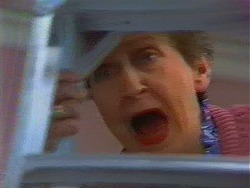 Mrs Mangel is horrified and insists she comes down at once - Daphne shouldn't be on a ladder in her condition. Mrs Mangel climbs up instead. Unfortunately Bouncer comes in and knocks the ladder over. 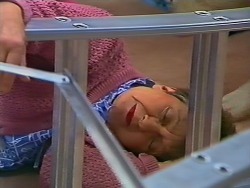 Mrs Mangel falls to the ground lies prone for an instant. Then she sits up and says she's got a splitting headache. MRS MANGEL: (to Daphne) And who are you, anyway? Where am I?